DMI Summit Cope collection two drawer lateral file is constructed of real hardwood solids and veneers with radius coped edges, nickel finished hardware, and a deep Cherry finish. 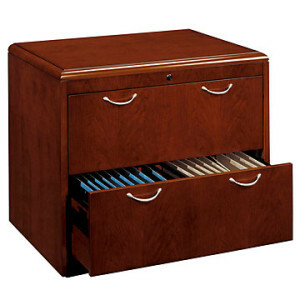 Lateral file features two letter/legal file drawers with five-sided dovetail construction and full extension heavy-duty metal ball bearing suspensions. File is equipped with an anti-tip device for safety.